Christopher A. Dion, B.Eng., M.A.Sc. 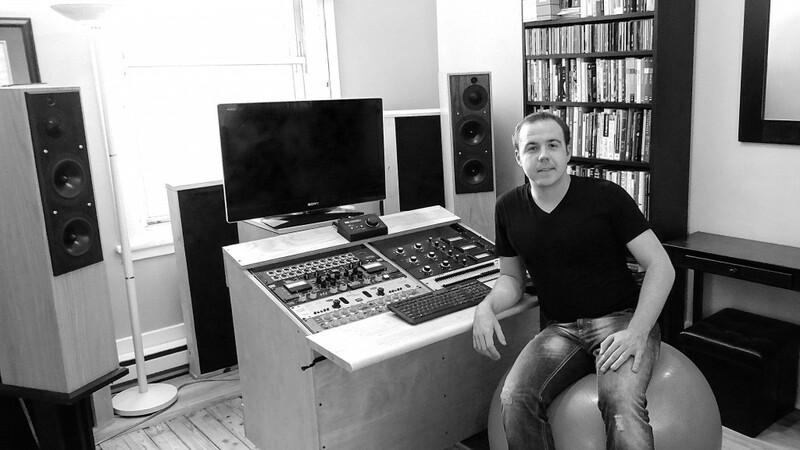 is a Mastering Engineer as well as the founder and owner of Quantum-Music Mastering. He is known of his keen ears, work ethics and entrepreneurial talent. He has written many scientific articles and also has 2 patents under his name. 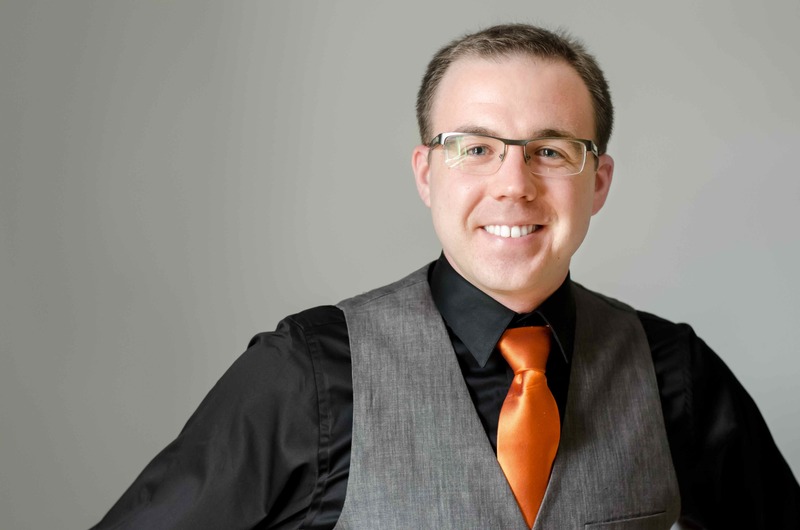 Chris lives in Montreal, Qc, Canada with his wife and his young daughter. Mixing Or Stem Mastering ? 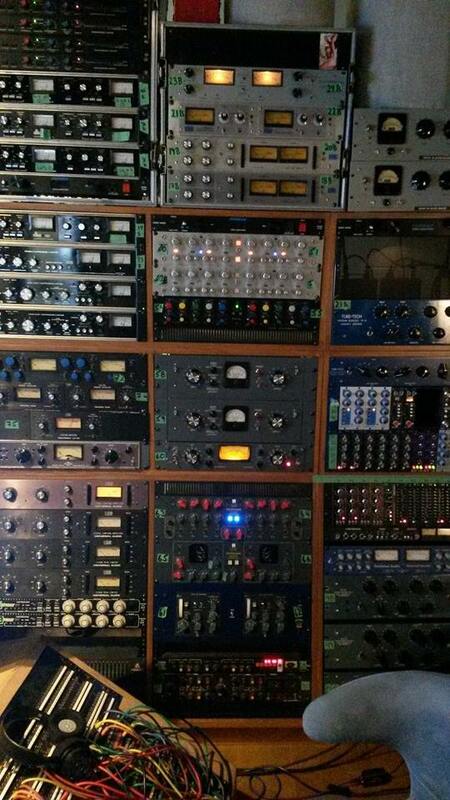 Mixing and Stem Mastering are services that are increasingly in demand. Since the beginning of 2016, 75% of our contracts now include stems of some sort. The great advantage is that it provides more flexibility, so the mix can be optimized before mastering. For us, Stem mastering is the solution of the future. You keep most of the elements you like about your rough mix, but the whole thing is then upgraded right before mastering. It allows us to catch mistakes and problems before it gets stuck in the mix. What files should I send you ? Okay, so you are about to send me your files over so I can operate my magic on it. Now you are wondering what you need to send. Here is a quick summary. The most obvious point where to start is the file format. All stems should be 24 bit WAV files, using the sampling of your DAW session. I prefer the following rate: 44.1, 48, 88.2 & 96 kHz. If you send over some files at 192 kHz, they will be downsampled to 96 kHz for mixing and Stem Mastering. “What stem should I make” you are going to ask me. It does require some judgement from your part, and by reading what follows you will understand it is part of common sense. The idea is to have enough tracks to improve flexibility, but not so many that the session gets confusing and/or redundant. Generally speaking, you can separate all the different instruments if you want, or group them by categories (All strings togethers, all pads and synths together, all guitars together, etc.). Just make sure that group you are making are working well, because I won’t be able to separate them afterwards. One thing I generally don’t want is to have more than one track per instrument unless it is really necessary. For example, you recorded the same guitar sound for different section of the song using the exact same guitar, but for the sake of your session you recorded it on three different tracks. Please put all of them on the same, unless there is a place where two guitars are playing at the same time, of course. The most common exception is the vocal, where you can have the all the main vocals on one track, but the chorus main on another one, and the maybe to other tracks for back vocals, then the ad libs on another one… Yes, that’s totally fine. Here are two example of sessions you might have, with some recommendation regarding the stems for each. John has recorded a real band using an impressive load of microphones. He used many close mics to capture every instruments. The drum only has 7 mikes. For the bass, he recorded the DI, but he also decided to mike a amp cabinet using two microphones. John also recorded two acoustic guitars using 2 microphones for each. He also recorded a piano using 4 mics and two lead vocals. Does Chris want all the separated track ? No, he does not. Bass – John combines the sound of the DI with the miked signals. Piano -Combines the tracks to get a nice Piano sound. Cindy loves to create music on her laptop. She does play some guitar, and a little bit of keyboard. She uses a combination of Mic’ing and Midi sequencing to create her songs. For her last song, she recorded the midi scores using her keyboard for many instruments such as Bass, Piano, Strings, Synth Pads, Machine Drums and some weird colorful provocative lead synth. She then recorded her vocals. She recorded each verses separately, then the chorus, and she stacked back vocals to support the main vocals. Total, she has 25 tracks of vocals in her session. Most of them have almost nothing on them. Lead Vocal (Verses) – A comp file of the best performances that makes the lead vocal. 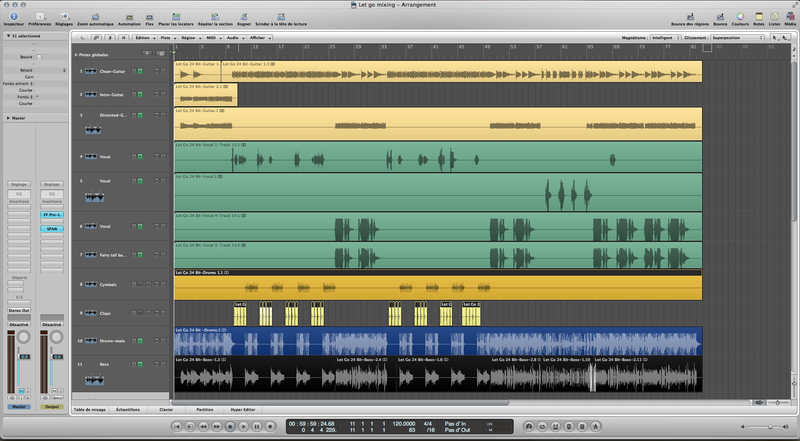 Back Vocals Left – Some back vocals that are belonging to the left side of the mix, mainly doubling the lead vocal. Back Vocals Right – Some back vocals that are belonging to the right side of the mix, mainly doubling the lead vocal. You can also upload a zip onto Wetransfer and send me the link to the same email address. Make sure you name the tracks properly, such as “Lead Synth”, “Lead Vocal” and”Piano”, rather than “master-rendered-file-1″, “master-rendered-file-2″ and “master-rendered-file-1″. How to achieve an Audiophile-Grade Mastering ? If you end up spending more than five minutes on an Audiophile forum, you will invariably read someone complaining about the fact that, even though our technology has evolved, Audio quality somehow went in the opposite direction. Of course, Audiophile are complainers. It’s part of their DNA. Their purpose in life is to be critical and difficult about what they are listening to (I sound like if I hate them, but that is not the case at all ;). It’s like wine tasting, it’s part of the hobby. Nevertheless, the issue is real in the world of professional audio engineering. We do have the technology to make it sound cleaner, purer, bigger and **Insert all the HiFi jargon you can think of here**… But Music is an industry. Therefore it is at the mercy of other factors that are not always artistical. 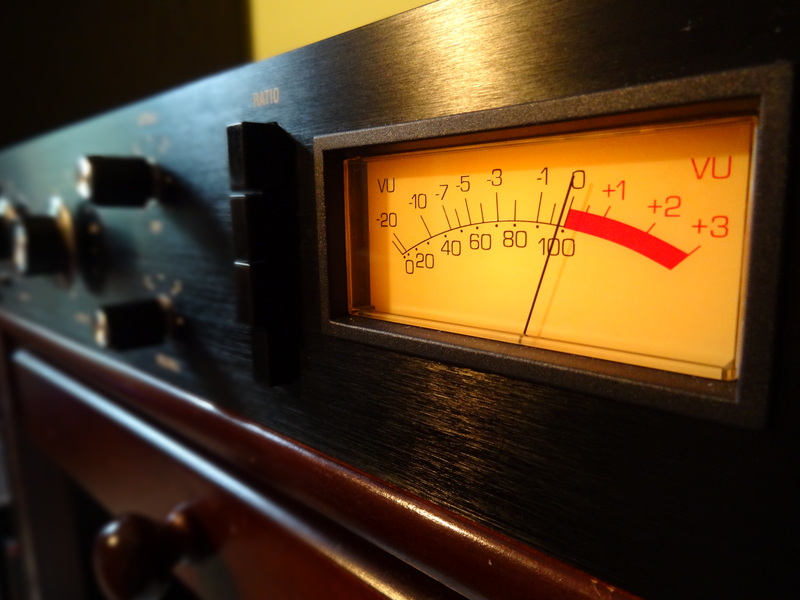 What makes a recording Audiophile-Grade ? There are no standard, recipe or reference book to follow. Yet, does that mean that it is entirely subjective ? The answer obviously has to be “No”. There is indeed a little bit of “Yes” to be included in the answer; Pretty much every recording nowadays are made in 24 bit, using modern recording equipment, using 32-bit float editing processors, and yet, most recordings sounds ok, to pretty bad. And even if you make it 32 and 64 respectively, there is absolutely no guarantee the product will sound better at the end. So if you look at the specs only there, this is one of the rare fields were you cannot judge the quality of a final product only based on the numbers. So why is the answer “No” then ? Yes… Let’s start with the most obvious one, and get rid of it quickly. To me, loudness isn’t as relevant as people think. Let me start with something bold here: Do we really care how loud it is ? Is there really such things as “The Competition”? The first step towards an audiophile recording, in my opinion, is simply to just stop looking at the meters, and go with what feels right. I honestly couldn’t care less if what I’m mastering is a D10 or a D20. (D-Something, usually refers to the difference between the Peak and the RMS volume of a material, D is for Dynamic range). Does it feel good ? Does it serve the music well ? These are the important questions to ask. That said, a lot of mastering engineers put a lot emphasis on metering, and I think that could be one of the reason why today’s recording are squashed. The value on the meter should interfere with the decision making process. But don’t misinterpret me here. I am not against loudness. I actually end up make things pretty loud if the genre requires it. What I’m saying is, we should never try to make it loud for the sake of making it loud. If the music naturally responds well to gain reduction and it feels good, and even asks for more, let’s give it what it wants. Where it is critical, it is when the music doesn’t respond well. You try to push it a bit and it falls apart or worse, you lose something exciting. In that case, you have to choices. First, you don’t care and you bring it to D10 because that’s what everybody does (What most people seems to be doing). Or secondo, you make it as good as it can, by focusing on how the dynamic is breathing with the compressors. Maybe you will end up at D10, D12 or D14, but honestly… I couldn’t care less. The second one, is my way of working, and until now, it has only served me well. “What feels good is what you get” is my mantra. There is a saying in the audio mastering field: “It is not how loud you make it, but how you make it loud”. These wise words mean, forget loudness for the sake of loudness, just try to make it sound as good as you can, and if you do your job well, it might turn up pretty loud without showing any signs of the side effects that the loudness war is known for. If there is one objective parameter you can change to make your masters sound more HiFi or Audiophile-grade, it is the sampling rate. If you compare 44.1 kHz to 96 kHz, they clearly sound different. The main advantage of using 44.1 kHz is that it saves you computational power. However, it comes at a price, especially if you heavily process everything. It brings a kind of crunchiness we can hear in a lot of modern production. Ironically, heavily processed music would benefit more from using high sampling rate than purist recordings (Jazz, Classical, and various Audiophile stuff), as the problem about 44.1 kHz isn’t the playback itself, but the processing errors (aliasing) that are adding up each time you’re adding a plugin. However, since using a boat load of plugin requires a lot of CPU power, heavily processed music usually end up being mixed in 44.1 kHz. 96-192 kHz on the other hand sound much cleaner, but obviously comes at the price of a heavier CPU consumption. This isn’t necessarily a bad thing, in the sense that limiting your processing will also make your recording sound more HiFi. 96 kHz is now my standard, as it does not really limit my processing in the case of a stereo Mastering setup, but sounds very good. There is also a much bigger gain in upgrading from 44.1 kHz to 96 kHz, than from 96 kHz to 192 kHz. 192 kHz can be somewhat restrictive in terms of CPU. Since I just mentioned it, as well moving on with this one. Every time you are adding an effect, you are trading a bit of “objective” quality in order to gain (I hope) some “subjective” quality. A HiFi or Audiophile-Grade mastering will be all about finding the perfect equilibrium between both, and in case of doubt, sticking to the objective one. The most purist albums will in fact work very hard to capture the best performance they can (Flawless recording session), then simply try to do as little as possible in post processing. One has to keep in mind that every processing comes at a price. But if one has access to a very high quality monitoring, and knows well the artifacts of each process, that person can optimize the recording A LOT before it has discernable artifacts. Obviously, if you hope to make an Audiophile-grade mastering, you need to have a top notch Audiophile-grade listening environment. This includes indeed the loudspeakers, but also the room acoustics, the amplifier and the A/D converter as well. The more transparent your monitoring system is, the closer you are to the truth. 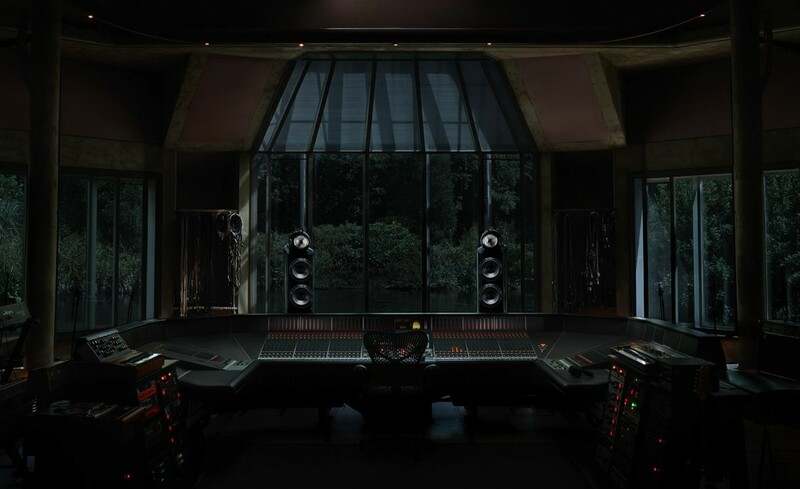 That’s no surprise that we see 20k$+ monitors in mastering studios. Now, what you do with it, is another thing… You obviously need both: The right tools in the right hands. That is a very important one in my mind. When you first start off in Audio, you might have a hard time to hear what a compressor does and you might not be able to discern a 3 db dip in a spectrum, etc. But then, as the years pass you become more experienced and aware of what you’re doing. You eventually end up hearing a much deeper dimension that I often refer to as tones and textures. It is like comparing a kid’s painting versus a professional experienced painter. You might the same element in the canvas, but one of them will add more effect, depths and textures. It is the same thing. I receive mixes sometimes and clearly, everything has been done in the box. All I hear is a blue car on a black road, an all blue see at the back and an all yellow sun smiling in the corner of the page. If they used digital saturator plugins, everything looks vivid like a children’s book. This can be good for some music genre, but it is obviously not or old rock and blues. Using analog gear can be used to add different textures to the project. It adds modulations to the sound that are so subtle and complex that the human brain as no choice but to interpret them as details or grain. NOTE: A lot of Audiophile productions are actually processed entirely digitally, mainly in the Classical and Jazz world. In that case, the production aims to reproduce exactly the performance without altering it in anyway. The objective is to be as close to the real performance as possible, not to make it more vivid than in reality. I want to emphasis the point that these performance need to be very well recorded by geniuses such as George Massenburg (McGill University, Montreal), otherwise, they can get boring very easily and sound very cold and digital-ish. 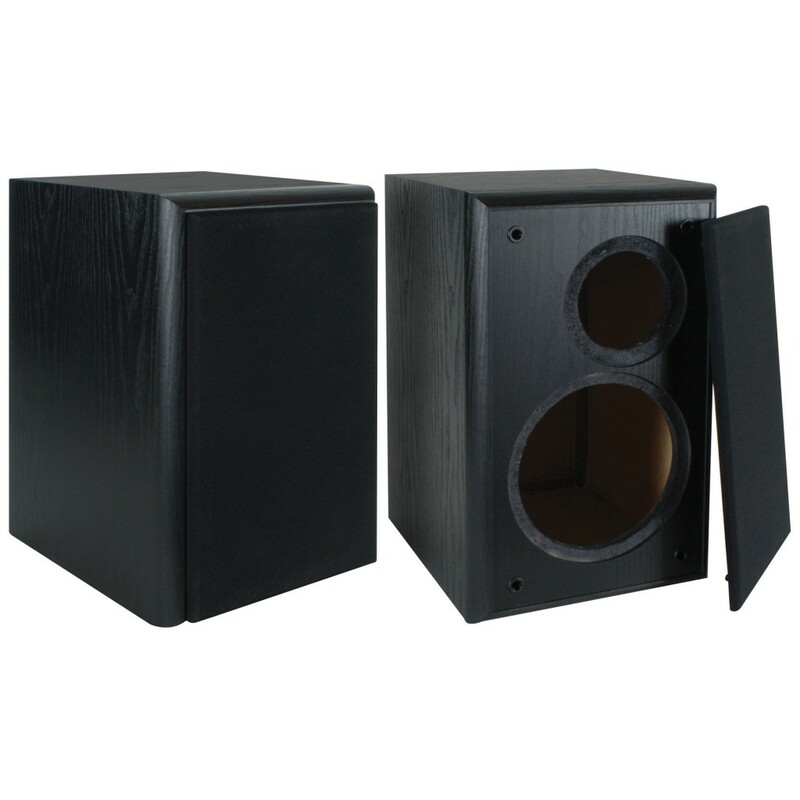 One great thing about HiFi loudspeaker, is that they aim to reproduce the dynamic very well. Audiophile will focus on how dynamic is allowed to move, and how the music is breathing with the speaker. To come back to the first line of this article, the main point that audiophiles complain about today’s recordings is the lack of dynamic (as well as a very high level of distortion… more on this later on). This can be related a bit to the loudness topic above, but the truth is, that it doesn’t necessarily have to be. While a good mastering engineer will be able to boost the volume without hurting to much the record, a great mastering engineer will be able to make a recording not only louder, but also more alive and dynamic ! That might sound counter intuitive to a lot of people, but compressors can actually be used to increase dynamics and make things sound more alive, as opposed to dull. All the trick is hidden in the attack and release time of compressors and other dynamic processors. I also like to use envelopper to shape the transient. At the mastering stage, it can be a bit late to address this point, I admit, but we definitely can help it. One method to work the sound stage on a stereo mix, is by using the mid-side technique. Using the mid side, you have control over different things: How the dynamics differs from the center to the side, how the center is louder than the side, as well as how wide is the side. This gives you the opportunity to make a boring stereo mix closer to a live performance. In a recent project I worked on, The performance had been recorded live, directly onto a stereo track. By definition, no remixes was possible. However, the mix was clearly lacking realism stereo-wise. Everything felt flat. By using some mid-side techniques creatively, I was able to really create the illusion that the singer is in front of you, but most important physically in front of the band. I was also able to give the feeling that the band was being and surrounding him in circle! The depth and feeling that was added to the whole project was definitely worth the extra effort! Clipping is often described as the “most transparent way to achieve loudness”. 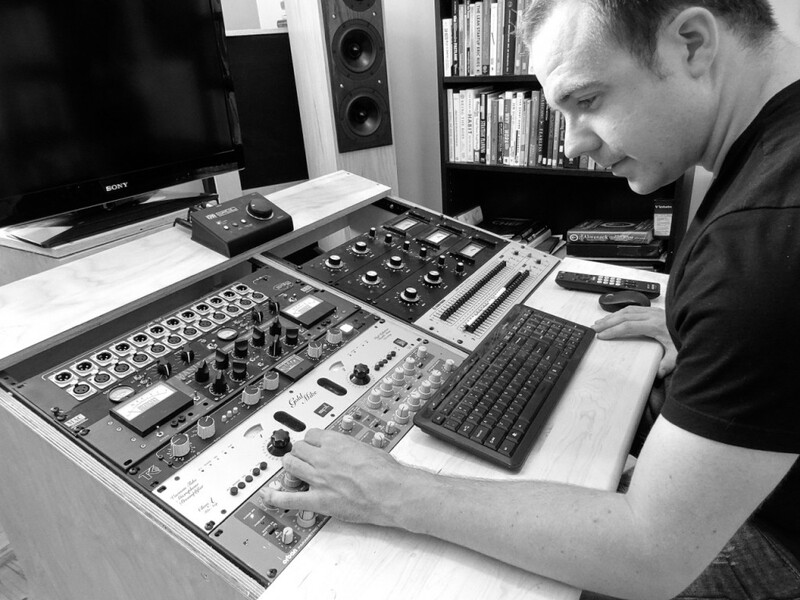 Some top mastering engineers, such as Ted Jensen at Sterling Sound, heavily rely on it to make everything sound loud. While it is true that clipping is dynamically quite transparent (Our brains can extrapolate up to a certain point where the peak was going anyway), it is not true that it is the most transparent acoustically, as it generates a great load of very agressive harmonic distortion. It makes a recording more agressive and brighter than it really is. It is also the number one factor that causes ear fatigue. Audiophiles have been complaining about “too loud and distorting records” for a while now. They were right. I think the good old trick of “Clipping it in the converters” has been overused. That doesn’t mean it is bad. It is just that it became a habit and because of that, it has been applied on records that absolutely didn’t needed it. Without clipping, many of today’s recordings could be considered as audiophile grade. But since they have been ruined by overclipping and they only good for radio hits, and cheap sound system playback. In order to master an Audiophile-record, I recommend using clipping very little, if not none. That comes a bit in hand with the loudness war. People got so desperate to gain half of a db, that they brought everything to the ultimate ceiling of 0 dB. Others, more conservatives, were using -0.1 dB as ultimate ceiling. The truth is that, even some expensive converters might overshoot if the peak is to close to the 0 dB, resulting in audible distortion. Also, while most people think that MP3 is low resolution format, you can actually deliver very high quality audio using this technology. Just have to leave it some headroom. -0.5 dB of margin is a good ceiling to respect, and I sometimes use more. It indeed requires a lot of experience and knowledge to produce High Fidelity masters. Although Audiophiles seem hard to satisfy, the truth is that we could easily have given them what they were asking for a long time ago. Their requests are rather simple: Good sound, mixed and mastered with good taste. The truth is that the trends audio production have been a bit out of hand for a while now. The access to more tools turned out to be a poison more than an antidote. I think we now need to sit back, and think about our work habits: Does this really need compression ? Does this song really feel like being smashed in a brickwall limiter 3 times per second? Does everything need to be that vivid all the time ? Does it makes sense to clip a ballad all the way through ? Sometimes, the answer is yes, often the answers is a plain no. Fred (France) is a young audio freelancer, and he’s been a loyal follower of my company for years. He recently asked me about a viable monitoring solution for mastering for about 500 euros or USD. My first impression was that it seemed impossible. Audio Mastering is the most demanding audio application I know, and to me, a 500 bucks budget for monitoring simply seems not enough. From experience, I know that there is nothing you can buy off the shelf that will remotely have the required quality for mastering. It seemed obvious to me that if there is a viable solution, it shall be the Do-it-yourself (DIY) way. My deal with Fred is the following, I was going to make the design custom for his needs, but I would make the design public via this blog, so everyone can benefit from it. Since the midrange is the most important part of the spectrum, I’m convinced that 3-way monitors are the way to go, as you have a driver dedicated to the midrange. Using the 3 way configuration, there is no crossover right at the middle of the spectrum. 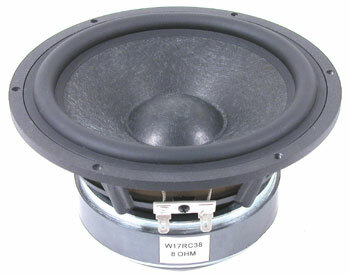 Unfortunately, 3 way tend to be a much more expensive solution than a 2 way, not only because you have 3 drivers instead of two, but also because you have 2 crossover points instead of one, the enclosure physically needs to be bigger, and larger woofers are generally much more expensive than midwoofers. In this case, being short on budget, it is obvious that we will need to make some compromise. The first one will be to go with a 2 way instead of a 3 way. Just by doing that, we are saving plenty on the enclosure, as well as on the crossover. Fred currently uses a pair of Fostex PM2 MK2. This is an active design. I personally believe it would be better to have it passive, as you are sure to have the best possible speaker for the price, and then you can always upgrade the amp multiple times in the future. For the price they were sold at, don’t expect to get anything better than a 15$ woofer and a 9$ tweeter in it. Such design usually are cheap on every components in order to make it competitive on the market. His original speakers (the Fostex) have a 8″ woofer, paired with probably a super cheap tweeter in 2 way configuration. It is obvious that the mid range of that speaker must be average to bad. Why do I say that ? Well, only high end and very expensive tweeter can go as down as 1 kHz (we are talking about 300$ per tweeter, ScanSpeak Revelator grade) and a 8″ woofer will be too heavy and slow to cover up in the midrange. For both drivers, distortion will increase drastically when used outside of their optimal range. I would say that a 6-1/2″ to 7″ woofer is about the biggest you can realistically pair with a good tweeter to cover accurately the midrange. The quality of the tweeter can make or break a 2 way design. In our case, we will need a tweeter than can go as low as possible without too much distortion artifact… and most importantly without breaking the bank. I know for a fact that Fred is working in a relatively small room, as do most audio freelancer who work from home. That means the woofer cannot be too big, as a small room doesn’t handle well large volume of moving air. The tradeoff is that we must accept that the low end extension is going to be limited. The good news is that by doing so, we can aim for a woofer that performs well in the midrange, without getting too pricey. Working in a small room also means that we are better to use nearfield monitors, otherwise the sound of the room will overpower the original signal. In that sense, a two way makes much more sense, as it requires much less distance between the listener and the speaker for the driver’s response to sum up. 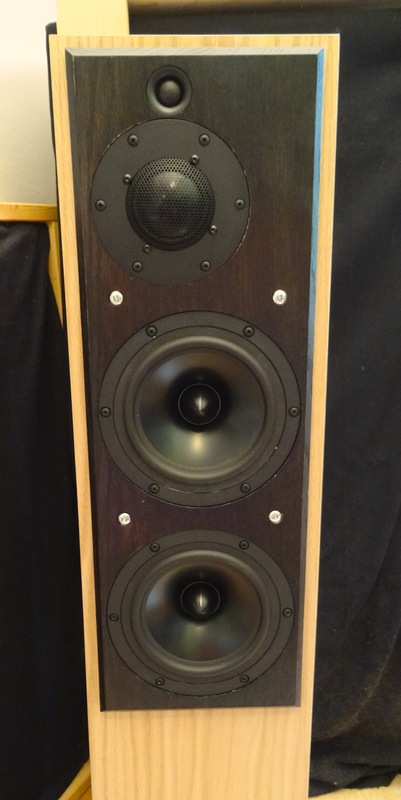 Some tower speakers, such the one I have require at least 2 meters to sum up. Going two way, not emphasizing too much on the low end means you can have a very precise and defined midrange (Using woofers with a low Qts will make it very responsive and quick to respond, but limit its low end extension). As discussed before, the midrange is key in Mastering. An interesting fact is that if at some point Fred decides to move to a bigger room, he’ll just have to complement his setup with a subwoofer and he will be good to go, assuming I have done my job properly. In summary, our objective is to put together the best possible monitor for critical listening, within a $500 budget. and a good value tweeter than can go low, with low distortion. 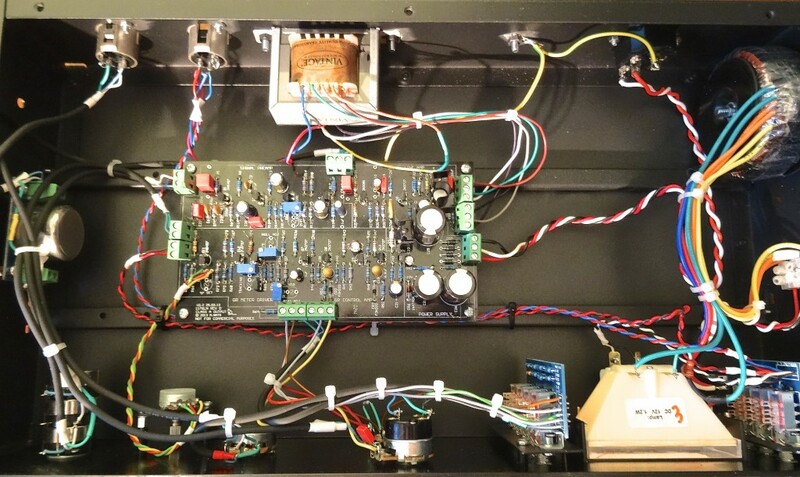 Knowing this, I like to start with finding an appropriate enclosure, for the simple reason that it can be a very limiting factor; the cabinet alone can be very expensive and its contribution to the overall sound quality is somewhat limited. In this case, we are looking for an easy solution that everyone can replicate at home. By looking on Parts Express website, I decided to go with the following Dayton Audio enclosure, that goes for about $65/pair. It’s a 0.52 ft^3 enclosure that already has the holes in it and comes with a rear port and the connector plug. Drivers can be countersunk into it, which gives a nice finish, but also helps phase coherence. Built quality is good and the product has a very good value. Shipping is free for Americans, unfortunately being Canadian, shipping is rather expensive in my case. The enclosure dimension will now define what driver I’m going to put in. I know most people would prefer to do it the other way around, but since they aren’t many options in terms of already made enclosure that’s the way we are going to do it here. 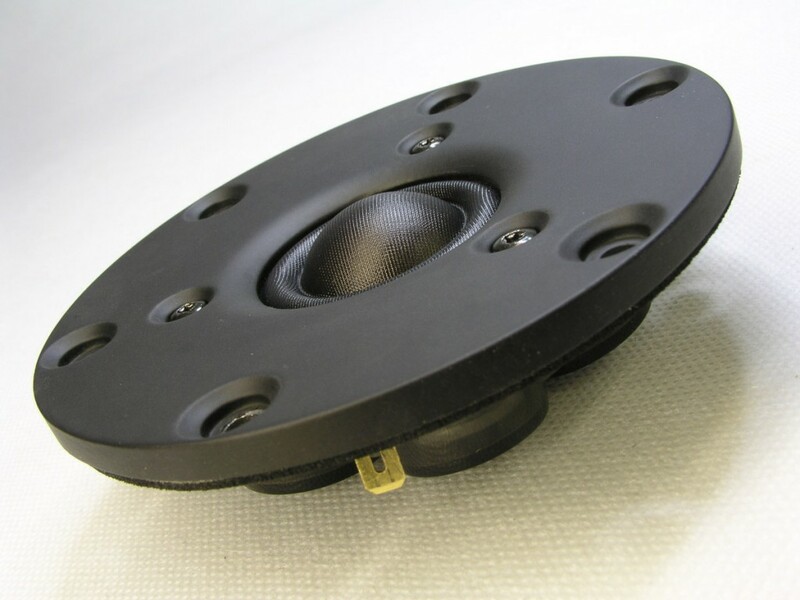 The woofer hole is made to accomodate a 6-1/2″ woofer with a flange size of about 165 mm. 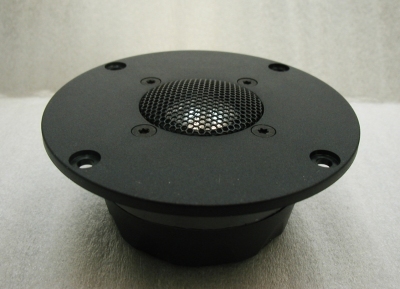 The tweeter flange hole has 110 mm. Since most tweeter has a flange diameter around 104 mm, that should not be a problem (will not fit perfectly, but pretty close). 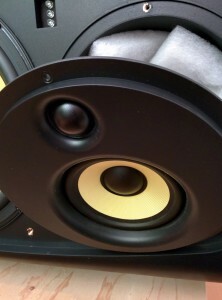 Woofer flange size are less standard in general, but if I stick to 6-1/2″ woofer I should be able to find something decent that fits. As I said before, the tweeter will make or break this design. In a two way design, roughly half of the spectrum will be covered by the tweeter. Also, the tweeter is where lies all the detail and definition. While a cheap tweeter will make high frequency sound harsh (shrillness), an expensive one will sound delicate, defined and beautiful. Scan Speak are currently making the best tweeters on the market but also the most expensive ones. Seas comes not very far behind, with some models in the $500+, but make also some very decent affordable ones. The Norwegian company has the reputation of making very good quality tweeter, with unbeatable fabrication consistency and tight tolerances. This a tweeter that you usually find in the $65, but is currently on at 50% sale at Solen. This tweeter has a great value for the price with a very smooth response, very low distortion of all types above 2 kHz. The high order harmonics is almost non-existant. Most interestingly, the transient response is incredibly fast on all the audible range. Transient response is a very important factor in mastering. The tweeter now selected, we need a woofer that will be able to take care of the other half of the spectrum. It needs to have a solid midrange good enough to take care of anything from the bottom of the tweeter range to all the way down. The woofer in a 2 way has to be very good, since it has to take care of the midrange, the low mid and the low end, all at the same time. Again, a Scan Speak from the revelator series would have done a great job here, but it would have cost more than $300/each. Fortunately, Asian drivers have improved tremendously in the last few years. Their performance is now not too far off from high end drivers, but their price is much lower. I’ve decided to go with the Silver Flute. It has a well built cast frame with a wool fiber cone and a reasonably smooth response with a minor breakup at 5Khz. 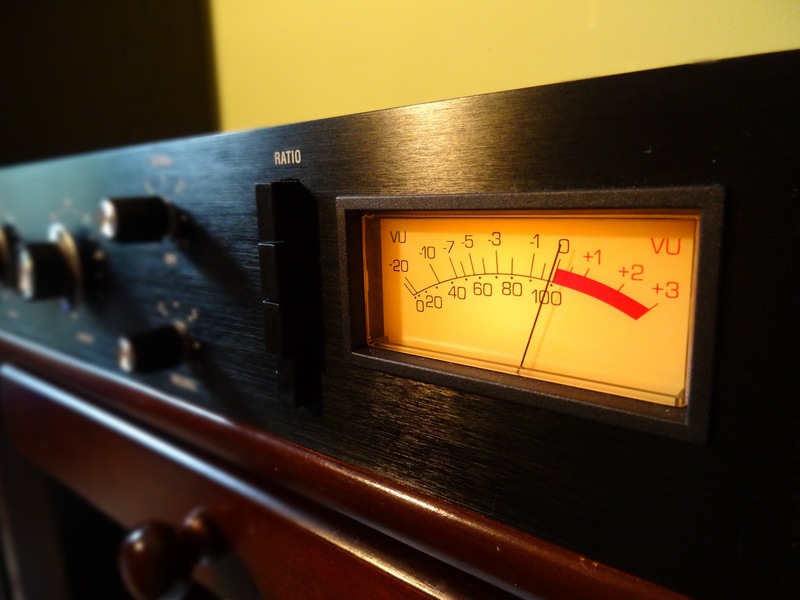 It has an average harmonic distortion performance above 1 kHz, but it is generally clean on its useful range. Bass is pretty clean, though not as extended as most 6-1/2″ woofers. It has a pretty tight transient response for a woofer of that size. This is due to its very low Qts, as discussed earlier. It has a pretty high sensitivity even for a 4 ohm driver, which makes it a very efficient woofer. Overall a very usable and well built driver of good value. The size of the box being already decided for us, it becomes easy for us to tune the port and decide how we extend the bass. Sometimes to limit our options is the best way to get creative and move forward. 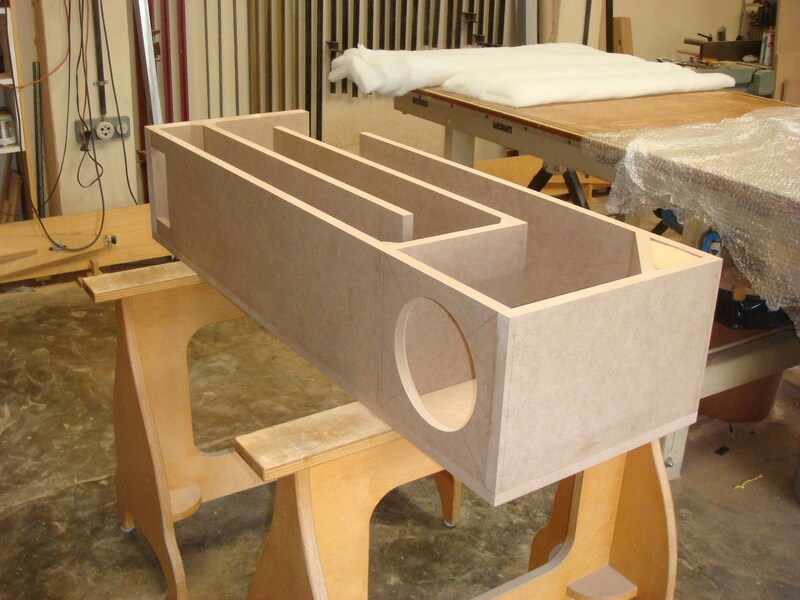 This enclosure is sized for an EBS design (Extended Bass Shelf), so I decided to go with the flow with it. The idea is to have a box that is just a bit oversized for the driver and then to tune the port close to the resonant frequency of the driver. 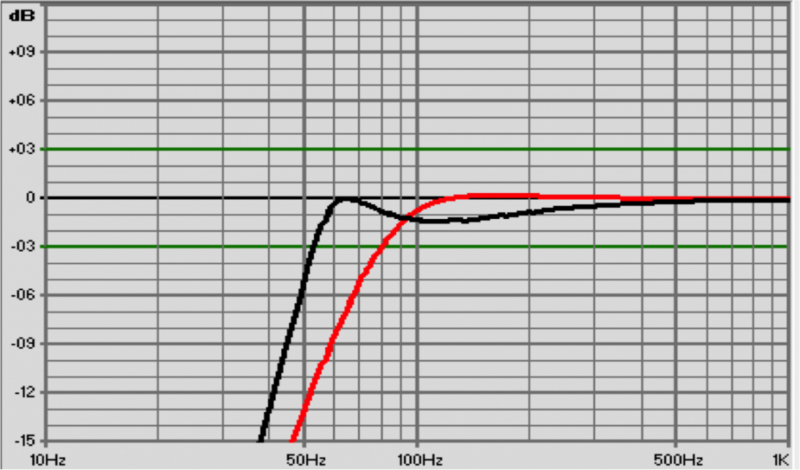 As you can see on the following graph, we are able to extend the bass by a lot. The drawback of this technique is that we are going to create a dip in the 100 Hz region. In this case, a 1.5 db dip is totally acceptable. This design gives us a – 3db around 51 Hz, which is not that bad at all, considering that I was ready to sacrifice the low end in the first place. As discussed before, Fred currently works in a small room. If he moves to a bigger room, he will just have to acquire a subwoofer to take care of the 25 to 50 Hz range. The Silver Flute model we chose is pretty clean in the low end for a driver of that size, which means it shall be able to handle the 51 Hz in a elegant way. The tweeter’s optimal range of operation is from 2 kHz and up, while the woofer’s optimal range is from 1 kHz and down. Therefore the most awkward part of the spectrum will probably be between 1 and 2 kHz, which is quite common for 2 way systems. Still, I don’t think it’s going to be as much as a problem, since both drivers are still very usable in that range, so I’m making it seem worst than it really is. Overall both drivers are excellent and aiming for a crossover frequency at 2 kHz LR4 will allow both drivers to be less audible in their weak range, and somehow, the weaknesses of one driver should be hidden out by the other one. In that case, the 2kHz LR4 crossover have been supplied by Solen Electronique (Canada). Solen are known for supplying the best crossover components in the world and are THE reference in the HiFi industry. I also added an adjustable L-Pad, in order to make the tweeter level adjustable. The baffle diffraction is actually hard to predict, so most of the time, the tweeter level is adjusted by trial and error by switching one resistance for another. 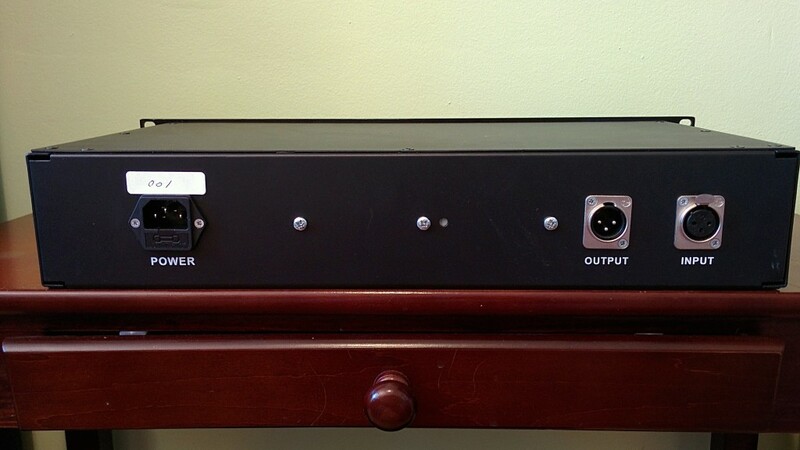 In the case of a mastering monitor, I thought it would be more convenient to have this adjustment accessible easily, so Fred can adapt his speaker according to how his room responds. Both driver are very responsive with low distortion rates. It makes them suitable for mixing and mastering all day without ear fatigue. Both the tweeter and the woofer sound precise, quick and yet, very smooth. 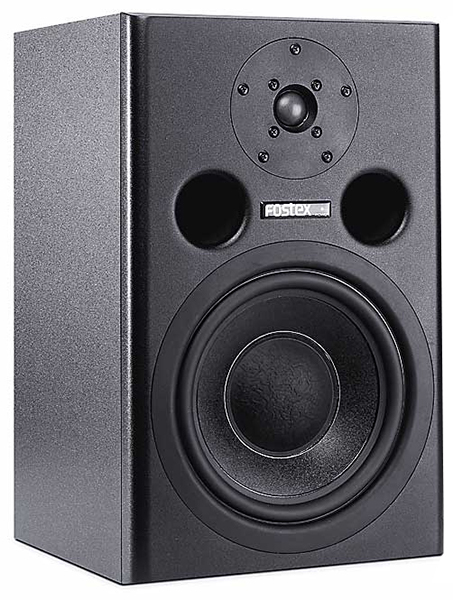 This box doesn’t sound as agressive as many low end “reference studio monitors”. The spectrum is full and smooth without any noticable dip. Cool fact: I thought the crossover point would be awkward and I was proven to be wrong; The two drivers seem to naturally blend into each other seemlessly. The only drawback I can think of is that at this size, the low end extension is somewhat limited, but we already knew that before hand. The important is that the speaker does its job flawlessly on its useful range, which I consider is the case. Fred will eventually need a high quality subwoofer to complement the spectrum, to cover from 50 Hz to as low as 25 Hz. If he is serious about becoming a mastering engineer, he will eventually have to. He will be able to rely on his monitors for the rest of the spectrum (51Hz to 21 kHz). In conclusion, I am very proud of this design. 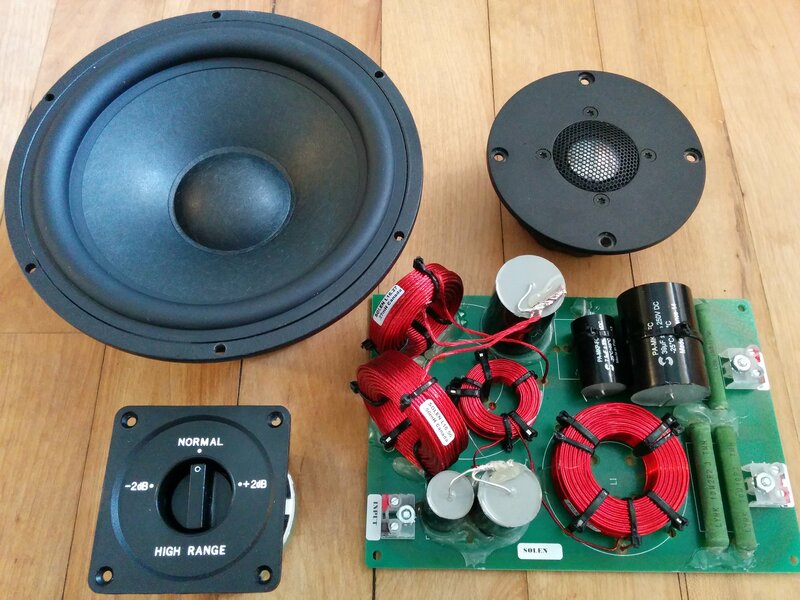 The final product is a very coherent and precise pair of speaker for about 450 EUROS / 620 CAD / 475 USD, and that includes shipping for the components to Montreal. These small boxes deliver more than you would expect from them and I don’t think you can get anything close to it in this price range. About my 1176’s – Answer to your questions ! Recently, I’ve published an article about the different types of compression circuitry, and gave some guidelines about when to use which. The articles have attracted much more people than I thought, and I’m very glad about it. If you’ve read this article, you know by now that I went crazy and bought ten (10!) 1176 DIY and got it assembled and finely calibrated. I currently have 4 of them in my rack, but only two of them (a stereo matched pair indeed) will stay permanently in my mastering chain. The other ones are for sale at discounted price and I’m actually losing money with them due to the crazy USD/CAD exchange rate. Being a small company means that I can’t afford lose my reputation or my customer’s trust over few pieces of gear. For that reason, I’m very intense on Quality Control and I make sure every single machine that gets out of my studio is top notch, even if it means losing more money sometimes. I’ve been very surprised that some were complaining about the price, I’m actually being very honest saying that this is a great deal. The Hairball Kit sells for 600 USD for a start, which is about 800 CAD these days… This does not include shipping, neither the custom tax which can be as intense as 30% for electronics. This doesn’t include the experienced technician time to assemble it (about 10 hours per machine) and another 2 hours per machine to fine calibrate it. So let’s say 50 CAD/hour, times 12 hours, which comes down to 600 CAD. And that doesn’t include all the materials and tools required to assemble it. We are roughly at least at 1200 CAD per unit. 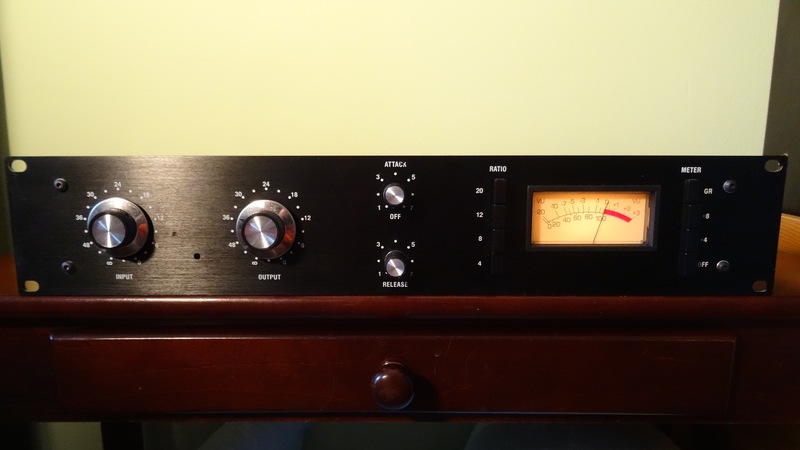 I’ve been selling a couple units at 900 CAD to Canadians lately, because Canadians were complaining about the price, while the Universal Audio 1176 is sold for $2000 USD (2600 CAD). The funny truth is that components in DIY kits are always either as good as the original or superior in terms of quality; There is no point in creating a pale copy of a great unit. Also, the machine are more finely calibrated than the stock UA 1176s. Why is that ? We calibrated with 3 iterations to make sure every units is top notch and stable over time, UA doesn’t have time for this type of Quality control. From now on, I’m selling these units 900 USD, and that’s a firm price. And Yes, I think it is worth that. So no, I don’t think you can have two for that price. “Yeah, but there is the Warm 76 for 600 bucks”. Again, that’s 600 USD. To Canadians, that’s not 600, but 800 bucks. Again, this doesn’t include custom taxes. To import it in Canada would cost another 200 bucks, you’re at 1000 bucks for a unit probably made in China. Think about it, they sell the whole unit assembled/tested/calibrated for the price of a DIY hairball kit. That does not inspire trust to me; there is no room for proper quality control at that budget, and you can be sure they cut the corner round on the calibration for that one. That said, if you feel okay with that, I have honestly no problem with you buying a Warm 76. Just know that you get what you pay for. Can I see pictures of inside the machine ? 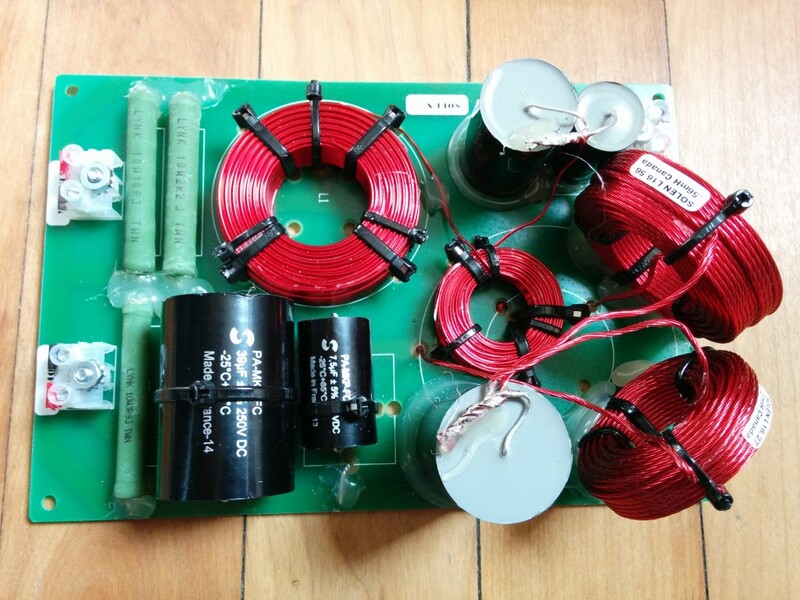 What about the Quality of the output transformer ? 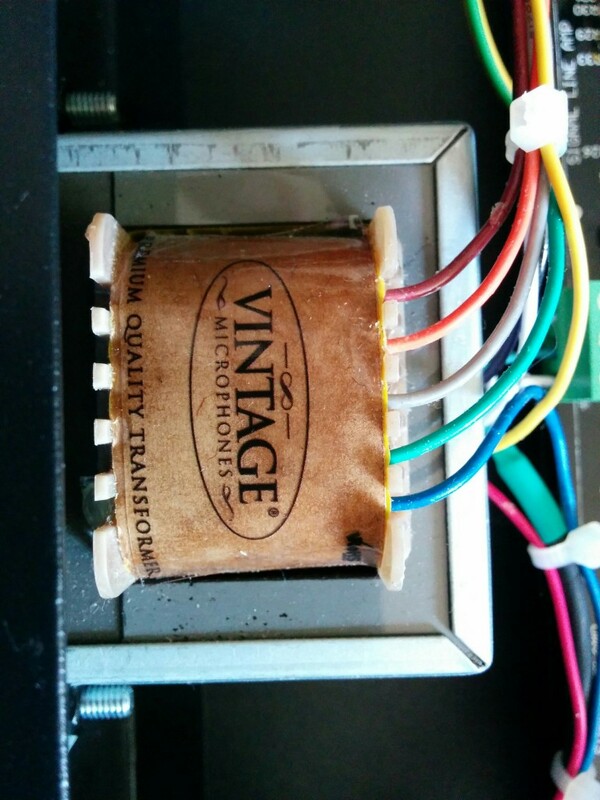 It’s a premium quality transformer. It sounds very nice brings a lot of color into the signal. 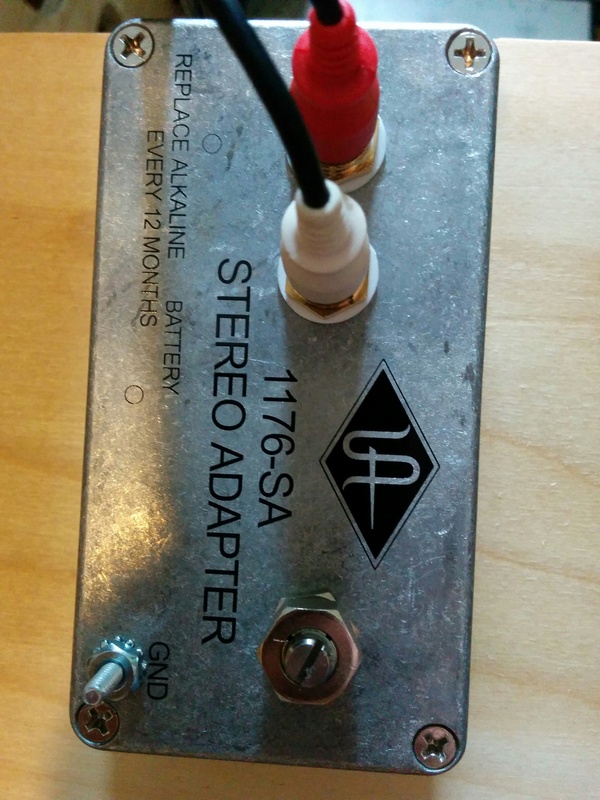 Most of DIY 1176 compressors don’t have the Stereo Adaptor option. At least, the Hairball kits, from which our models are built from, didn’t have one. Ours didn’t neither at first. Since there has been a demand for it, we’ve decided to integrate it to our models. It was first discussed to apply this change only to the match pairs, but since they all are very carefully calibrated, they would all be good candidate for Stereo Link. To Stereo Link two 1176, you will need the Universal Audio 1176SA (SA for Stereo Adapter), a little box sold for about 100 USD. In order to conduct our test, we’ve bought one from Sweetwater’s website and plugged it in our modified machines. It turns out it worked much better than I expected and it sounds pretty cool. Do they really sound good ? Yes, they sound really really good. Just to say, I used them in my Mastering chain. All the records I have mastered in 2015 have passed through it. My clients all know that I’m very critical about the signal path I’m using, and I have no tolerance for less than perfect machines. I’m also very intense on calibration and maintenance. The big deal about the 1176 is two things: First, its tone. 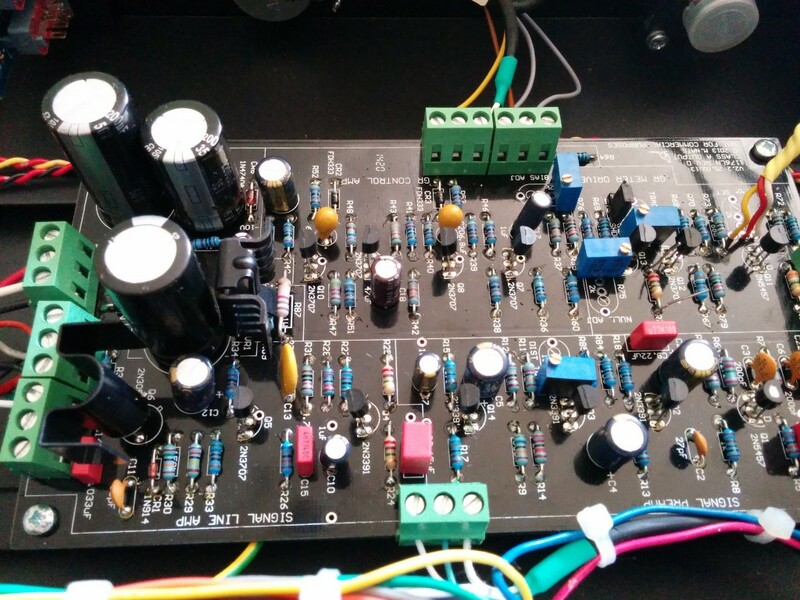 It has a very nice distortion due to the output transformer. I often use it without compression, just for its tone. The compressor also has a very unique behavior. It’s a very fast unit, so there are multiple uses for that. Stereo Compression: Linked or Separated ? 1) My Manley Variable Mu is dusty and would benefit from being cleaned. 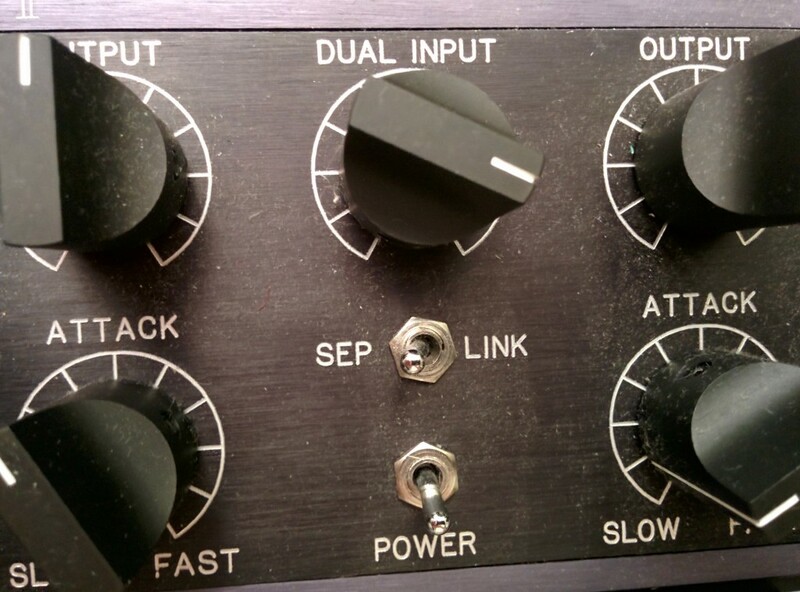 2) It has a Separate/Link switch for two different stereo compression mode. The last two days, I’ve been exchanging emails with Drew (Vancouver, Canada) regarding the following question: “Stereo Compression: Is it better Linked or Separated?”. You have two perfectly calibrated machine in parallel and you process your left and you right separately (in dual mono), that would technically be the perfect stereo compressor; as you pass a mix through it, and there is no surprise. The center stays at the center, and the side are compressed accordingly to what passes through it. That’s actually how plugins work because digital is « perfect », at least in terms of calibration. 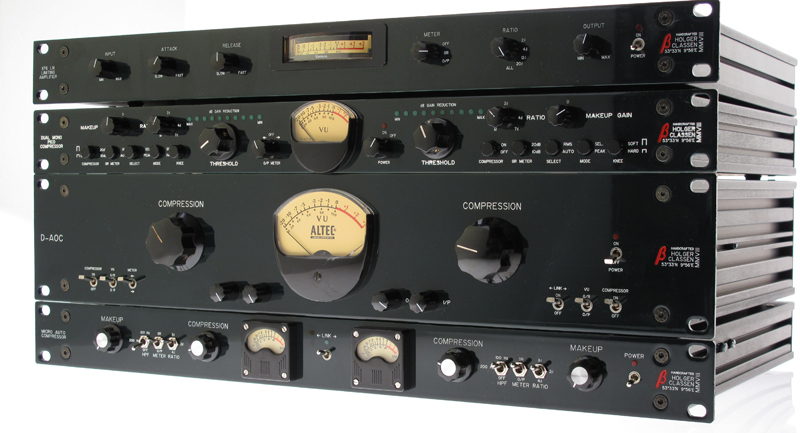 Stereo analog compressors often give you the option to go linked instead of separated, which kind of « sums both signals for its detector circuit ». This is actually not always true. For compressors having individual controls for each channel, the link mode combines the gain reduction and make both GR equals. It basically applies the largest GR value of both compressors to both compressors. The manley vari-mu works that way in Linked mode. I can have two completely different settings on both sides and whatever GR value is higher at the moment is applied to both channels. So, back to the case, you have a mix where there is a super loud Low Tom hit panned on the left side, and a soft string pad on the right side, a crazy gain reduction will be applied on both side. For the left side, it is the appropriate response: The huge tom hit is controlled. On the right side, however, the strings is damped by 6 db while it shouldn’t. This therefore creates an important artifact in the stereo image. So why the stereo link option exist then, you will ask ? *Please note, that a Separate mode on a Stereo Compressor usually wouldn’t have this problem, as both channels are matched pairs. While processing the same mono signal through both channels of a stereo compressor, both mode should sound exactly the same for identical settings. If it does sounds different, that means your compressor needs calibrating/servicing. Linked mode can help to cover it up temporarily, but that comes to a price; a distorted stereo image and a mix that breathes less. It’s always better to have to identical machines. Using the same tom and string example, there would likely also be a vocal or lead instrument in the center. With separated stereo compression, the Tom side would get brought down and leave the string side at its original level (no nasty side effect in the strings), but the vocal in the center will appear to move to the string side. This is can be distracting and sometimes worse than having the string duck a little while maintaining the vocal in the center. While this is absolutely true, I usually don’t personally hear it as a problem. Indeed, both linked and unlinked modes have uses, advantages and disadvantages, but I personally find that dual mono sound better all things considered. Interestingly, many mastering engineers I know are thinking the same, while Mix engineers often seem to like them linked better. This is probably due to the fact that the dynamic range of the material as well as the amount of gain reduction applied on each is dramatically different when used as a mixbus compressor versus when used as a mastering compressor. Overall, I think it is safe to affirm that linked will often sound closer to mono and contained (Center as a priority), while separated will tend to sound much more open and wider. At the end, it might also just be a question of taste, or a matter of affinity with the music genre (EDM and Hip Hop,versus Jazz, Rock and Alternative). Overtones from lower frequency harmonic distortion will appear at the top of the spectrum and will make a mix seem brighter than it really is. Affordable speakers are usually not linear in the top end region and have terrible harmonic distortion profile in that region as well. Compressor detectors are more easily triggered by the low end content, so the dynamic of the top end remained uncontrolled. Acoustics has a huge effect on both ends of the spectrum. The obvious answer to Fred’s question would be “Well, you listen to it…”. The fact that the question remains means his problem is more closely related to his listening environment as he does not seem to trust what he’s hearing. Technically, if you have a perfect speaker in a perfect room, and you listen to the best reference available long enough to print that balance in your mind, every mixes that you will produce will have the right balance and translate well everywhere. Now, we know that there is no such listening environment, but with a decent budget and a lot of work we can approximate it. In fact, having a dedicated room for mastering is an on-going work. It requires constant work, and the addition of slight improvements will make a huge difference at the end. Size your speakers accordingly with your room. 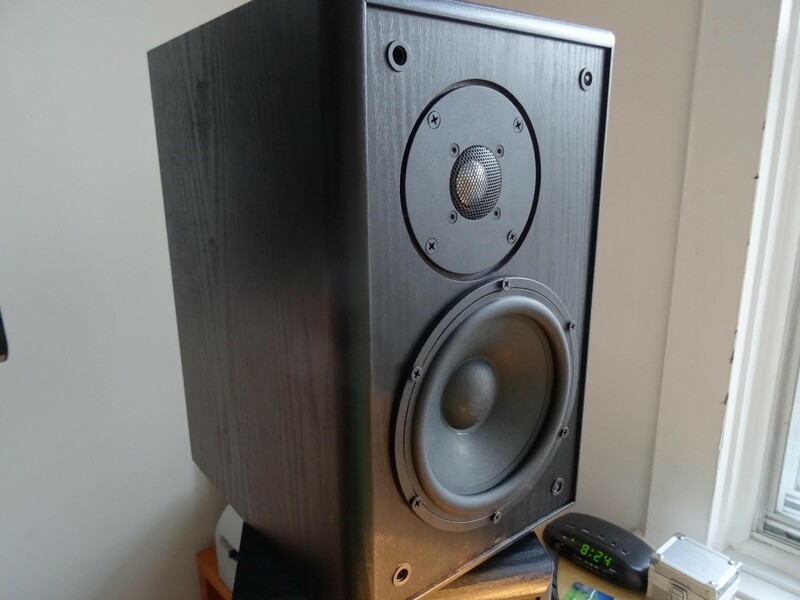 If you convert your small bedroom into a Sound Studio, don’t go with huge speakers with 2x 10″ woofers, the low end will react badly, pretty much like a over sized sub woofer in a car. Bookshelves are good for small rooms, Slim towers for medium room size, and big monkey coffins for big rooms. You should place your speakers away from the walls, especially if they are back ported. The closer you are from the speaker, the quieter you’re monitoring to your mixes, less you will hear the room and the more you will hear the details. Compensate for your speakers weaknesses; Wood floors will sound bright, carpet sounds dull, brick sound mid rangy, etc. Some active speakers have tweeter level adjustment. By listening to reference recordings you can tweak it so the speaker blends into your room. These are the first top recommendation I have on the top of my mind. Please do not hesitate to ask any other questions here if something isn’t clear. Don’t forget, the more critical is your listening environment, more you will be able to trust your ears and go with the flow! If well recorded, high voices and flutes shouldn’t sound harsh at all; They are soft and smooth instruments. Adding high frequency to such instrument is usually desired, as it brings out “air” and detail. The first thing we have to figure out whether this shrillness really is in the recording in the first place, or simply if it’s the monitoring that is harsh sounding. Having heard the original recording in question, I would be tempted to think that its the tweeters of your monitors that are harsh sounding, as the recording sounded very smooth and define. The best way to know is by listening to reference recordings. Are they feeling the same way? If the answer is yes, then it’s coming from the tweeter. Lowering it down might help the problem. If not, “shrillness” or “harshness” is usually associated with high distortion levels. Make sure you have no distortion/saturators/exciters in the chain. Still, cheaps audio interface have the nasty tendency to add harshness to a recording. In that case, the only solution is to spot the worst harsh sounding frequencies in the recording and to notch them out. Sometimes a little 0.5 db notch does all the difference. If that frequency is really hurting, you might need more than a db. Personally, I combine many of such notches on every fatiguing frequency during mastering, so a loud master won’t sound harsh and aggressive. Or could it be dynamics ? As mentioned earlier, a compressor will be triggered by lower frequency content. Therefore, it often happens that the low end is pretty tight, but the high frequency content remains uncontrolled. In that case, a DEESSER might be the right solution. A deesser is in fact a high frequency limiter and it definitely is a very powerful tool. This tool was originally invented to take care of agressive “sss” sounds that are often present when recording speech, but it can be used for anything dynamic in the high frequencies. I personally use deessers on about everything that has dynamic high frequency content. It’s mainly useful for cymbals, high hats, vocals, shakers, guitars, and of course, overall mixes. KRK RP-10-3 is the first pair of speaker I bought when I officially registered Quantum-Music Mastering as a company about 4-5 years ago. My father, my girlfriend and I teamed up to by this pair of speaker and it was by far the best thing we could buy with the budget we had at the time. I was used to working on small KRKs. I also had huge HiFi speakers before that and I had great confidence that I could achieve great masters with larger than life KRKs. 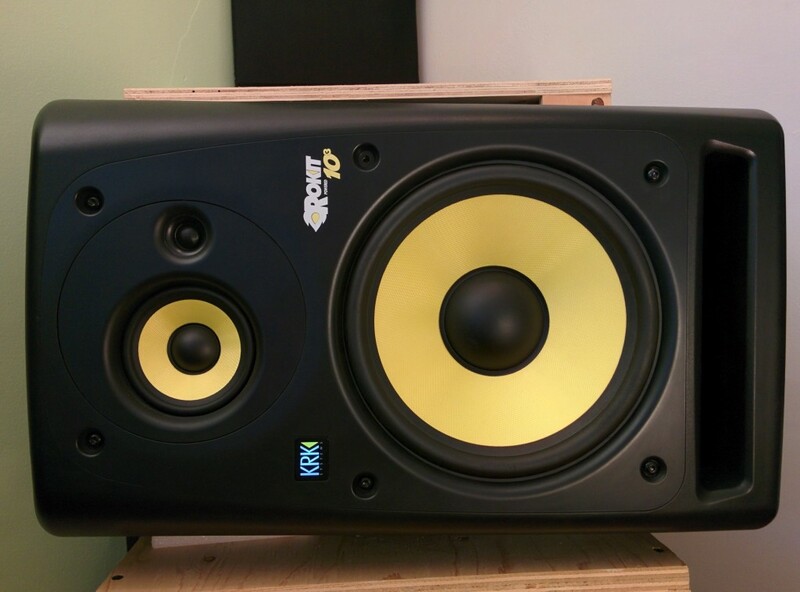 According to specs the KRK RP-10-3 were great: flat and extended frequency response, with adjustable low and top ends. Just what I needed for mastering… well I thought. So, what’s wrong with it ? The bass was soft and undefined, long ringing. The tweeter had no detail, and no realism at all. When working all day long on it, ear fatigue was a real problem (mainly due to the tweeter). The integrated amp was incredibly noisy. For the first one, the easy fix was to block the port with the foam. I used the kind of foam that we put on beds to make the mattress softer. People get rid of these all the time. That cost $0. I lost a bit of efficiency; I had to increase the woofer level. Since we have a knob for that at the back, it wasn’t a problem. I lost a bit of low end extension. 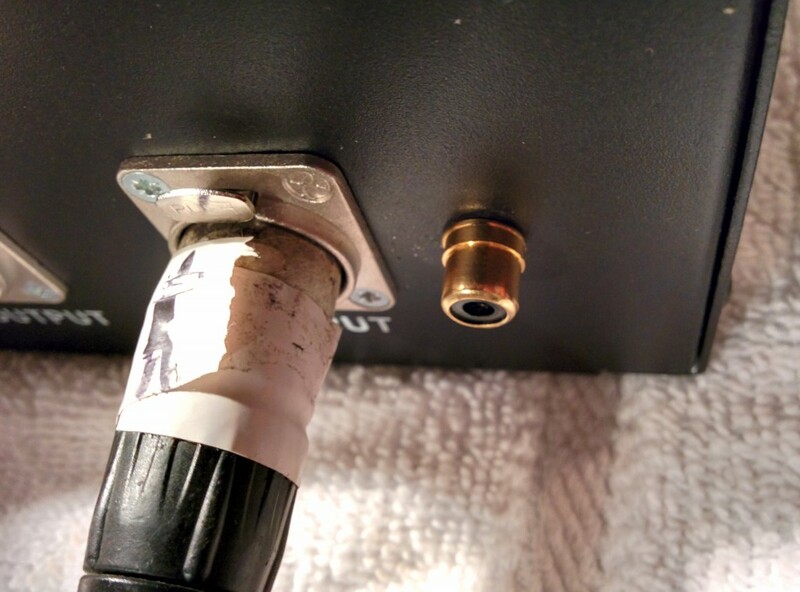 I ended up removing temporarily the foam when I needed to check something below 40 Hz. It’s wasn’t perfect, but still a viable compromise. Finding a good tweeter that could press fit in the 1 3/8″ was the biggest challenge. I was disappointed to see that no high end tweeter would work. Still, I’ve been able to find something quite decent, especially for the price. 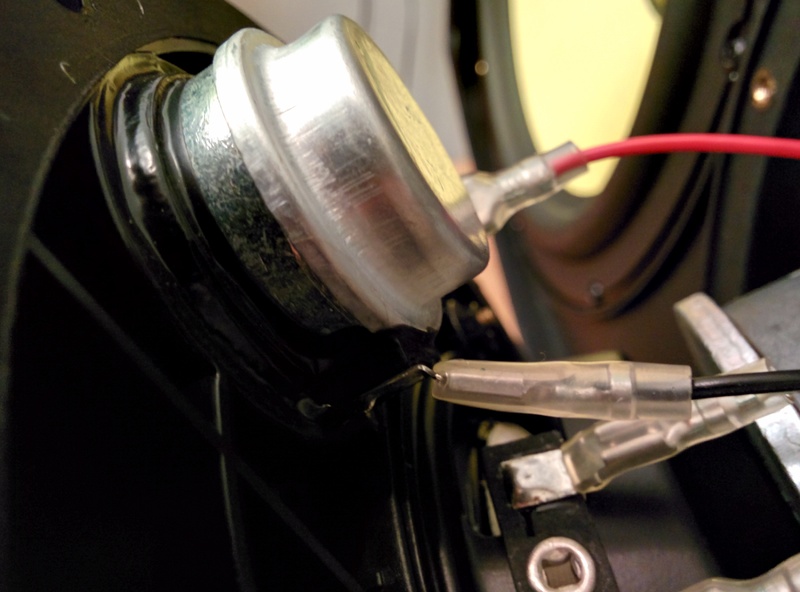 Available for less than $10 on Parts-Express (http://www.parts-express.com/dayton-audio-nd16fa-6-5-8-neodymium-dome-tweeter–275-025), Dayton Audio ND16-FA is the best tweeter I found that could physically fit the 1 3/8″ hole. 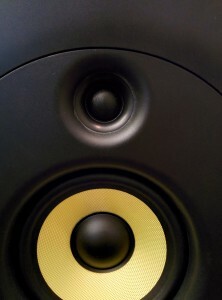 It’s a 5/8″ neodymium soft dome basically outperform most tweeter in that price range, including the KRK original one. 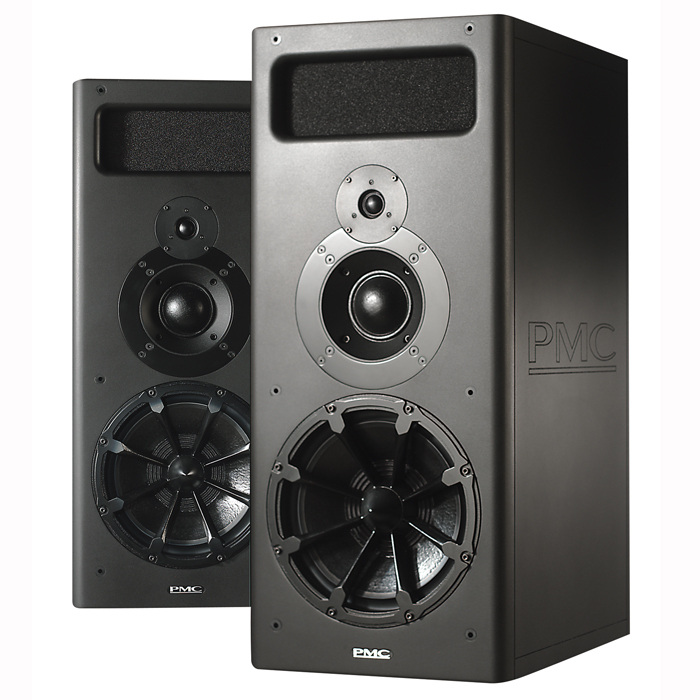 The RP-10-3 being a 3 way design, the tweeter doesn’t need to have a super extended frequency response. That’s good because flat and extended frequency responses come at a price. Against our first impression, the frequency response is really usable. The descending slope will be compensated by the crossover slope to give a flat final response. The response is ruler flat on its audible range, which is what matter the most to me. There is clearly a breakup node at the end of the audible spectrum, which some people would call “Air”. I’m personally okay with that, as super expensive tweeter also have this shape sometimes, and it kind of compensate for the frequency response of our ear. So, it’s all good on that side. 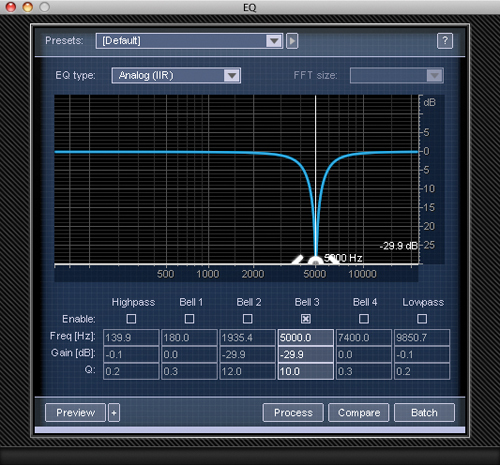 Working all day on speakers, I’m very picky about distortion profiles. 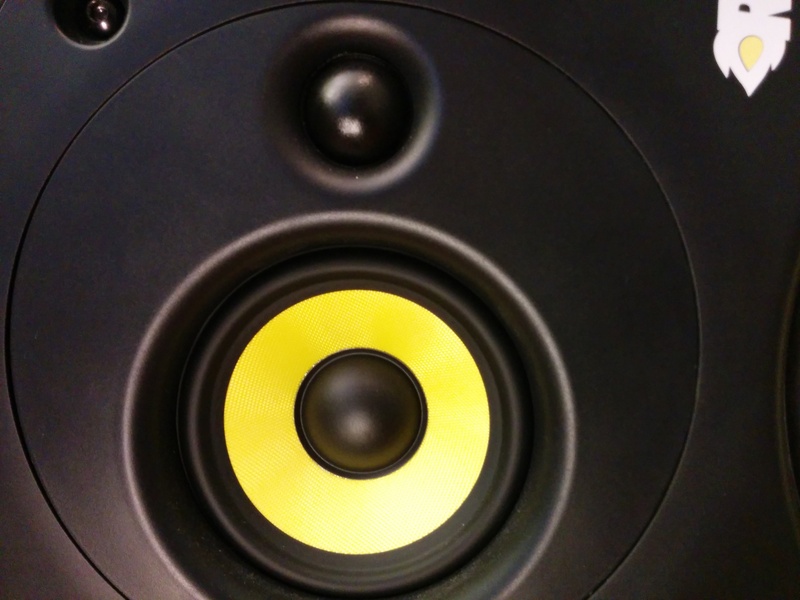 Having a clean non-fatiguing sound contributes greatly to the quality of the studio experience. I used to get very tired at the end of the sessions as my KRKs where literally killing my ears. Low distortion levels are often refer to “clean”, “pure”, “detailed” sound. The ND16Fa has a pretty clean distortion profile for a tweeter in this range price. This is especially true above 4 kHz, as the second order get quite high below this point. The KRK being crossed around 3.5 kHz means the tweeter can be used without any issues. This is often due the fact that tweeter doesn’t respond fast enough when it should play and keeps ringing when it should stop. For those who are fan of colorful 3d plots, you’ve been served! This chart above shows us how tweeter will react once we play a impact noise (i.e. snare). It is like a frequency response plot, but the third dimension is time. You can see that in the range of interest (3.5 kHz to 16 kHz) the tweeter responds exactly how it should: It plays when it plays and stops on a dime when there is no signal. On that matter, the ND16Fa competes with very expensive tweeter. There are clearly some ringing around 2.5 kHz and around 21 kHz, but both of them are out of our range of interest. What about the crossover ? At the time, I was looking for a quick fix rather than an elegant optimized solution. In other word, I didn’t even looked at it. I knew what was the crossover point and I measured the impedence of both tweeter. I knew the new tweeter had a slightly bigger impedance, but it was all fixed by cranking the HF level up a bit, so no problem here. The crossover frequency might have shifted slightly, but nothing noticeable. 3.The integrated amp was incredibly noisy. For the last point, the only way I “addressed” it was by using them in a mid-field/far field configuration. That’s it! That wasn’t complicated at all, right ? 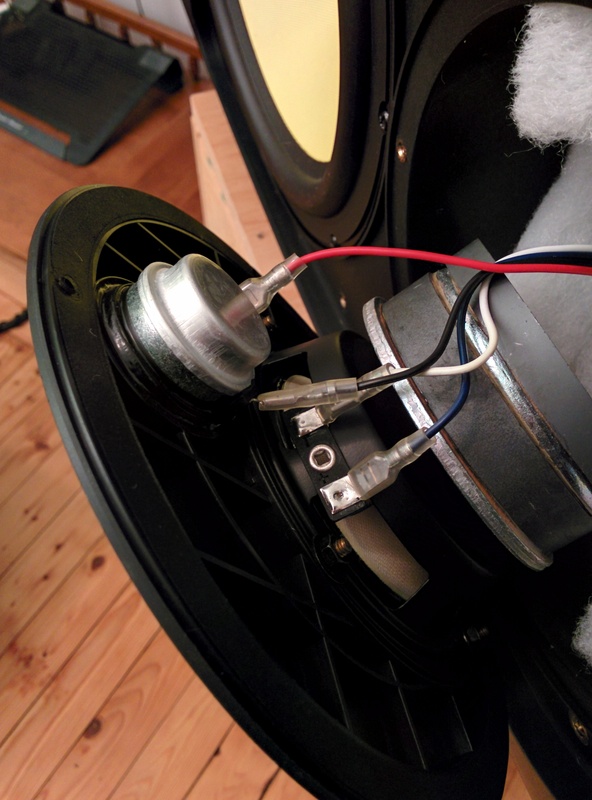 Still, I have to admit that it took some guts to cut out the tweeter from a brand new pair of speaker. That said, that was totally worth it. How does it sound you ask ? Well, it still doesn’t sound like a $10000 pair of speaker, but there was definitely some major improvements. Not bad for $10 mod !